This Bar Star from Washington, D.C. shakes up an award-winning cocktail, and has a whole lotta' heart to back it up. 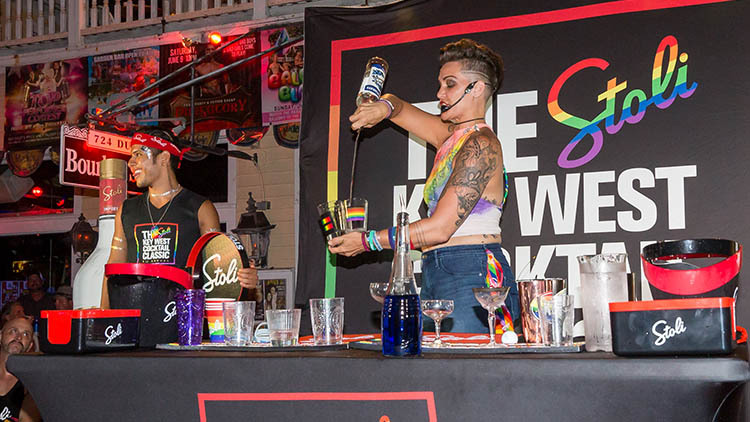 The 5th Annual Stoli Key West Cocktail Classic is unlike any LGBT bartender competition out there. 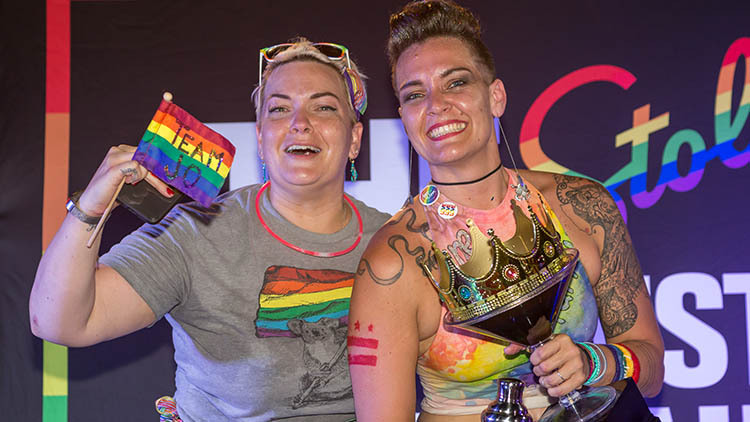 Fourteen Bar Stars from across the U.S. and Canada each brought their top signature Stoli cocktail recipe to Key West to compete on the grandest stage of LGBT bartending. After two bartenders who were voted “Fan Favorites” by over 5,000 fans on OUT.com were given placement directly in the finale, the remaining twelve competed in two elimination rounds at Aqua and 801 Bourbon Bar to earn a spot in the Main Stage finale. 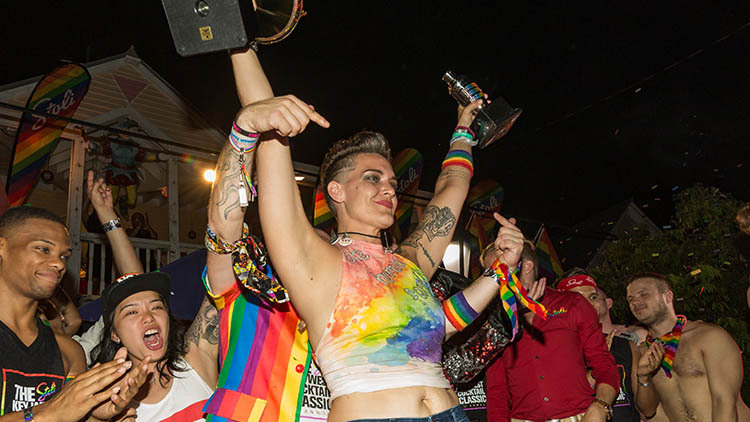 After six-days of fabulous events and countless Stoli cocktails, ultimately one North American Champion was named in front of hundreds of fans on Duval St. - the bubbly Bar Star from Washington, D.C., Jo McDaniel. The Stoli Key West Cocktail Classic is not just about cocktails. 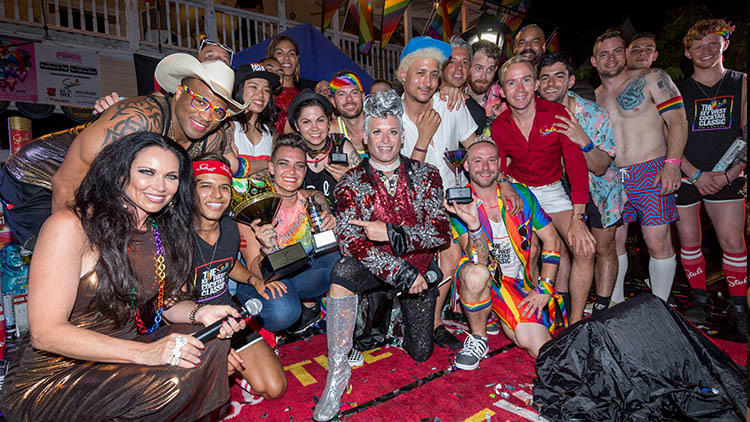 This year’s finale was also the platform at which Stoli brought to life their Heroes Raising The Bar campaign and celebrated the launch of their first-ever Stoli Harvey Milk Limited-Edition Tribute Bottle, dedicated to reinforcing the brand’s commitment to LGBT equality. Not only did Jo's win earn her the title of #1 Bar Star, in addition to the trophy, she earned $10,000 for her selected non-profit organization, Casa Ruby, and $5,000 for a local Key West charity with which she was paired; AIDS Help of Monroe County. This week, OUT caught up with Jo to see how her life has changed since winning the 2018 Championship title. OUT: Jo, congratulations on being named the champion of the 5th Annual Stoli Key West Cocktail Classic! How does it feel to be the Number One Bar Star in North America? Jo McDaniel: Thank you so much! I’m so honored to be the champion. I feel strongly that I am not the same person I was before I went. I came back inspired and uplifted in a way that I didn’t know I could be. First of all, my competition was utterly phenomenal - the best North America has to offer, hands down. I mean, come on - one person spit fire on stage! Secondly, this competition was created to highlight the safe spaces our LGBT community has to offer. As someone who has always bartended in gay bars, it’s my privilege to work toward creating such an atmosphere. I’m very proud to have represented this amazing city in a competition that has such incredible intentions, as Patrik’s vision lines up closely with my own. How have your friends and family in Washington, D.C. and at Cobalt, the bar you represented, reacted since the win? I’m incredibly lucky to have an amazing support system - I’ve had so many people reach out, having seen my performance, to tell me what the things I said meant to them. My family has been so supportive. My dad called me a celebrity, which I found so endearing, and my daughter posted on her own Instagram, congratulating me, which is a huge deal for a 15-year-old! Behind the bar, people in DC have been so loving, and I worked our ladies party recently and actually recreated my cocktail a lot. Tell us, what inspired your “#UpgradeYa”? How did you go about creating it? The theme of this year’s competition was Raising The Bar, and I wanted to incorporate that theme into my cocktail. I also wanted to pay tribute to my many years in this industry and in this community, so I upgraded a vodka and soda, which is a wildly popular cocktail choice, in my experience. I decided to use Key Lime juice to give a shout out to Key West, a place I felt was so darling and loving and just made me feel so entirely at home. And you made a really touching decision onstage to use barware from six of your competitors who did not get a chance to compete in the finale. What inspired that decision? Two rounds were held prior to the finale, in which 6 competitors were eliminated. The fourteen of us quickly bonded in our mutual desire to do amazing things for our amazing community. I wanted to make sure that even those eliminated knew they were being represented, and also just to honor their hard work in having made it to Key West! If you had to describe your time in Key West in one word, what would it be? So hard! I think “loving,” will be the closest to touching on this experience. I felt love from the community of Key West, in welcoming all of us. I fell entirely in love with my competitiors - a group of humans so willing to do so much good, with such open hearts and minds. And I found self-love again. I remembered why I love our industry, why I’m good at it, and the love I want to spread in doing good work. What was your favorite part of Finale Week? Hands down, the highlight of this week was the people. The people of Key West (and the visitors in town for Pride) spread such joy, everywhere we went. There’s just such a feeling of love and acceptance floating around. The Stoli team was so amazingly supportive, making sure we knew that we had them in our corner, and what the plans were, every day. They worked so hard to give us a week that would change our lives, and they more than succeeded. Our mixology expert, James Braun, even opened his home to let competitors use his equipment to prep - amazing! We’re a family now, a group who changed and inspired each other, who raised each other up. I’m so in love with our whole team, our petit family. We loved seeing your sister in Key West supporting you throughout the whole Finale Week. What did her support mean to you? There is no way that my words will do justice to what my sister means to me; and how much I needed to have her in Key West with me. Ashley McDaniel is an extraordinary human being. It is one of the great gifts of my life, to be bound to her by blood. From the very first event we went to, she spread the joie de vivre inherent to her, to everyone she came in contact with. Not only did she “handle” me throughout my competitions, she made sure that even people who didn’t have a support system felt welcomed, felt the love and the spirit of what we were all doing there. Right away, she understood the magnitude of this competition, and fully embraced Patrik’s vision for what we would all be representing, in participating. There is absolutely no way I would have won, without her support. I believe that so fully, that I insisted that my trophy for the Spirit Of Key West Award live at her house. She embodied that spirit so fully, that not a single person there remained untouched. Tell us, what advice you would give to future Stoli Key West Cocktail Classic competitors as the 2018 champion? Oh, there’s so much I could say! I think namely, remember WHY you’re there. Find your gratitude, just at the opportunity. Let the enormity of the message that you are spreading stay with you. Allow the experience to change you, allow the people to get under your skin in a good way. Soak it all in, take that amazing feeling home with you, and do something amazing with it. As for the competition itself, just be yourself. Don’t forget to talk as you’re mixing your cocktail, don’t forget to engage with the judges and the audience, and make sure you let them see who you are! 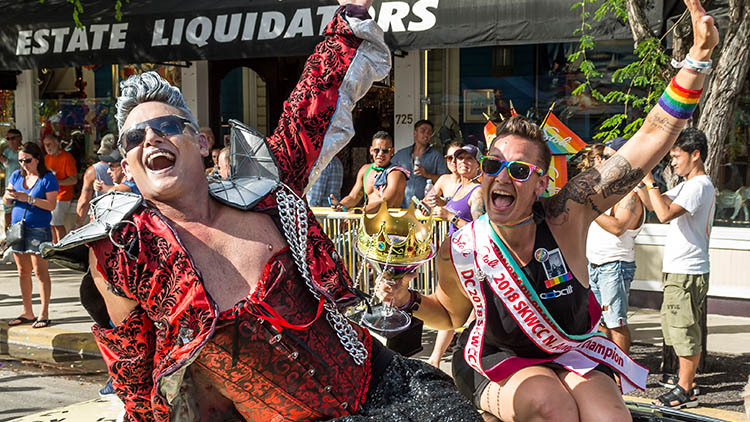 You were named Honorary Grand Marshall of the 2018 Key West Pride Parade. What does being part of the celebration mean to you? Pride has always been incredibly important to me. I love seeing our community show up in the spirit of celebration. I’m so honored to have gotten to ride in Key West’s Pride parade as an honorary Grand Marshall. It was an amazing party, and to get to sit beside Patrik Gallineaux, National LGBT Ambassador for Stoli, who’s done so much for our community, was particularly wonderful. As a competitor, we really don’t get to interact too much with Patrik, throughout the events, as he’s hosting/running them. So to celebrate with him from the back of a classic Cadillac was a real treat! On top of the title of 2018 Stoli Cocktail Classic Champion, you won $10,000 for the charity of your choice, Casa Ruby. What did it mean to you to be able to share this with them? I’m absolutely thrilled to be able to bring that money home - Casa Ruby does so much for our community, so it thrills me to be able to help out in this way. This money will go a long way in helping the LGBTQ people of DC, who Casa Ruby reaches out to and touches. I’m honored. An additional $5,000 went to benefit a local Key West charity, AIDS Help of Monroe County. What was it like meeting them? AIDS Help of Monroe County was so supportive of me. They created posters every time I competed, and reached out to me regularly, making sure my sister and I felt welcome while we were in Key West. I was compelled to choose this charity because I believe it’s incredibly important that we end the stigma our generation has put on HIV/AIDS, and make sure that ALL of our community has the resources they need. 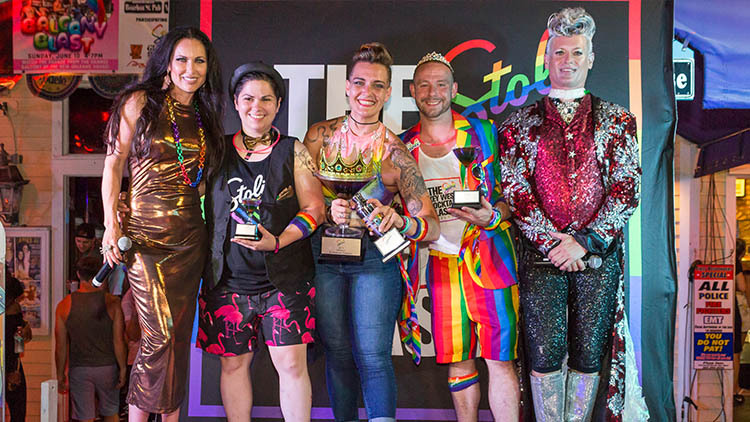 The Stoli Cocktail Classic honors the unique legacy of gay bars as the original LGBT safe spaces, and the important role of bartenders in this community. What do these spaces mean to you and your profession? My entire professional career has been dedicated to making my bar a safe space. What’s wonderful about being a bartender in a gay bar is that there are so many ways to provide that to your customers. These spaces mean everything, to me, to our community - the safe spaces are where we come of age, discover who we are. We meet our people, we have our hearts broken, we fall in love. So much can happen, when we’re free to be ourselves, to be safe. It’s our responsibility, as service industry professionals, to do what we can to provide that experience, that safety. Stoli celebrates Heroes of Diversity who raise the bar for equality within their own community. Describe what diversity means to you? I feel really lucky that I represent such a diverse city. Our community is comprised of the most amazingly colorful humans. Diversity is inclusive of so many things, for me. It includes race and lifestyle and gender presentation - everything that makes us different, that gives us individuality. I feel like to be surrounded by people of all backgrounds allows us to be constantly growing, and affords us all the opportunity to change the world by holding space for each other, giving voices to those who aren’t being heard. I think that’s how we truly affect change: by working to understand, love, and celebrate each other, through our differences. You’ve just won the Stoli Cocktail Classic, what do you plan to do next? Well, it’s time to change the world. As I said before, I’m not the same person that I was before I left for Key West. I’m determined to use the momentum that Key West provided to propel me forward. I want to affect change in my industry, in my city, and ultimately, throughout this incredible community. 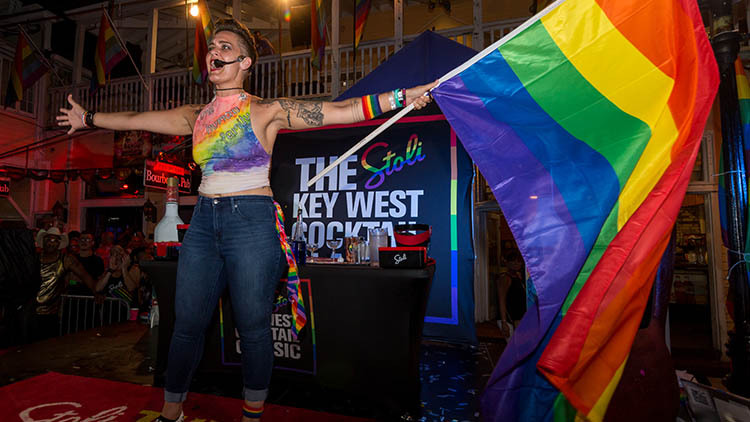 The Stoli Key West Cocktail Classic was intended to do good, to have fun, to highlight are safe spaces and the talent we have in this industry. My goals now are to do right by this amazing new family, to be a worthy champion. Oh, and travel a lot, because I already miss my new friends immensely! Additionally, I’m honored to have been asked to run the new queer women’s bar in DC, named A League Of Her Own, slated to open at the end of July! OUT and Stoli welcome all to celebrate with Jo McDaniel at her 2018 Stoli Key West Cocktail Classic Champion Celebration and Charity Check Presentation, live at Cobalt in Washington, D.C. on Friday, July 20, from 9:00 PM to midnight and dance 'til 2:00 AM. The event features a mini-concert by chart-topping recording artist Debby Holiday (“Dive”, “Joyful Noise”) and is hosted by Stoli’s Global LGBT Ambassador and SKWCC program producer Patrik Gallineaux. Stoli cocktails are only $5.00 all night, and the evening also features three “Stoli Power Half-Hours” in which all Stoli flavours and non-alcoholic beverages are complimentary to celebrate Jo’s 2018 victory, with the first held from 9-9:30pm for early-birds. Must be age 21+ to enter. Check back on OUT.com/KeyWestCocktailClassic for more information on the 5th Annual Stoli Key West Cocktail Classic. For more on Stoli’s Heroes Raising The Bar program, visit HeroesRaisingTheBar.com.